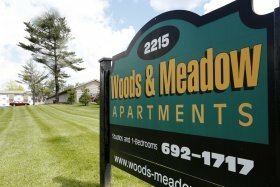 Woods & Meadow Apartments is a 112 unit community, conveniently located at 2215 Willow Knolls Drive. Woods & Meadow offers quiet, secluded living in beautiful Peoria IL. Featuring a sparkling pool, on-site laundry, spacious studio and 1 bedroom apartments as well as a professional management and maintenance staff. For more information call Professional Leasing Services at 309-691-0900 or e-mail us via our contact page. “The neighborhood is so nice and quiet. They will come and fix whatever it is that needs fixing as soon as possible. We love the area.” – Amanda S.
“I’ve only been here a month, but they’ve been very responsive to my questions and needs. I already love the school district. And my dogs are welcome too. We’re loving it.” – Tonya S.